You are here: Home / Living Life / Botanical & other gardens – or – how to enjoy gardens – without the work! 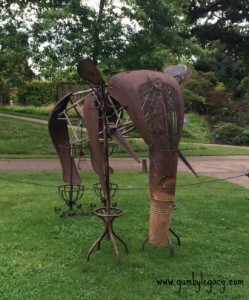 Botanical & other gardens – or – how to enjoy gardens – without the work! Since coming to live back in the UK, I have come to appreciate and realise that I can enjoy the plants I have always loved – without needing to be responsible for them, or having to have the space to accommodate them! So, when out shopping for plants, I can immediately cross off my list those that are in the gardens of my neighbours or those I pass often. Lovely, no need to plant magnolias, wisteria (although I’m still trying to make a plan to accommodate that one), wigelias, or, thank goodness, dahlias. Then there are the trees, oh such sources of joy throughout the year, from their naked silhouette in the winter, to the first sighting of a touch of green leafing, through to full leafy splendour, blossoms followed by each trees own unique fruit, to the colour changing foliage spectacle and finally, the delicious crunching of (yes, I admit it, messy but) autumn leaves underfoot – as well as the joy on a toddlers face at this new delight! So, I am especially delighted to realise the affordability and excuse for an outing that organisations, such as the various Botanical Gardens throughout the country, the Royal Horticultural Society together with their affiliates and the National Trust, give to visit their beautifully maintained, scientifically directed, interesting and well cultivated gardens. Here lies the chance to see the traditional as well as new dynamic ways of laying out herb, vegetable and flower borders, as well as growth habits, seasonal changes and to simply fall in love with a new plant or realise that, actually, the particular plant I was wanting to get for my garden has too vigorous a growth pattern for my pocket handkerchief garden to accommodate! Over the past couple of months I have enjoyed visits to a number of places. 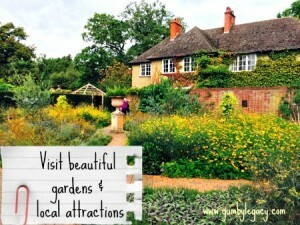 Wisley Gardens – which felt amazingly familiar with so many plants we used to grow in our gardens in South Africa! 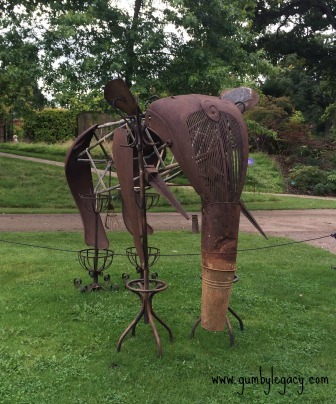 Also on display here was an amazing collection of art work such as the Tortoise and the Hare and an Elephant, in Surrey! 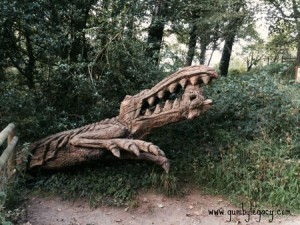 Margam Park – with it’s Castle, Orangery and parklike surrounds, complete Deer Park, Adventure Park, Fairytale Land Playground, Rare Breeds Farm Trail and lakes, – even found a crocodile here! The Wales National Botanical Gardens in Carmarthenshire – probably my favourite so far but I need to re-visit without the distractions of the antique fair and wet weather! Beautiful views and large open spaces with delightful herbaceous borders, herb and vegetable garden, complete with pumpkins ready for halloween delights! Dyffryn Gardens near Cardiff – lovely old house, beautiful gardens as well as a restaurant and children’s playground which are accessible to pop in to without having to do the visit to the gardens and/or house. Polesden Lacey, Petworth House, Tredegar House and the amazing Eden Project are other places that I have been privileged to have the joy of visiting, each of which I plan to re-visit one day, at a different time of year to experience the changing seasons.